Potentially the most satisfying thing about reading so many indie comics is coming across books which are so good that I have to ask myself, “Why isn’t Image comics publishing this?” When I ask myself this question, I always hope that the answer is because the creator has turned them down, not the opposite. Protege is that kind of good. I was immediately caught up in the 007-badassery of the main character, Trane as well as the overall action-packed espionage of the world and I hope to read further issues. Protege starts full of action and gunfire like a good roller-coaster summer film and immediately introduces a fun cast of characters like Trane as I mentioned above. There’s also some fun dialogue not only keeps the book rolling along but also makes the characters not only interesting but compelling. The characters are so appealing that when a shocking event happens at the end of issue, I was not only blown away, I was even more interested in reading the next issue – a good sign for any comic, let alone a truly indie comic. Something I was very conscious of as I read Protege is that it feels like a film. I generally have problems with any comic that works too hard to show its film potential. Comic books are a medium of their own, not a stepping stone toward big-film-money. However, with Protege, even though it would make a great film, the creators are more than well aware of how to craft the story for comics and not just be a screenplay for a movie. In fact, I would argue that the filmic-sense of Protege is actually the creators adding film-flavor to the story, bringing action-packed genre sensibilities that much more intently to final production of the comic. 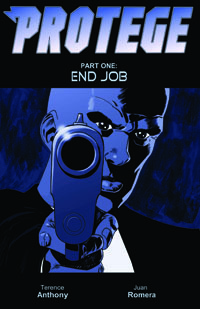 This entry was posted in Columns and tagged end job, indie comics, juan romera, madjoint productions, protege, protegecomic.com, terence anthony. Bookmark the permalink. Follow any comments here with the RSS feed for this post. Post a comment or leave a trackback: Trackback URL.